On Thursday, 31 January, Patriot Company held their annual Cadet Change of Command. At this formal ceremony, the current Cadet Staff is relieved of their duties and replaced by another set of deserving Cadets. This relieving process is completed every year in order to give the greatest number of Cadets the opportunity to develop and hone their leadership skills. The Patriot Company Choir, Led by Cadet Petty Officer Third Class Elise Fosmark (second from left), sings the National Anthem to open the ceremony. Prior to the relieving process, parents, family, and friends had the opportunity to advance seven Cadets to their next ranks. These Cadets recently passed their respective advancement exams. Six Cadets (from right to left) Evan Rosenfelt (11), Jacob Hill (11), Katelin Ovsak (10), Olivia Van Ry (11), Faith Ellis (10), and Christopher Lew (11), were advanced to the rank of Cadet Chief Petty Officer, the highest enlisted rank in the NJROTC program. 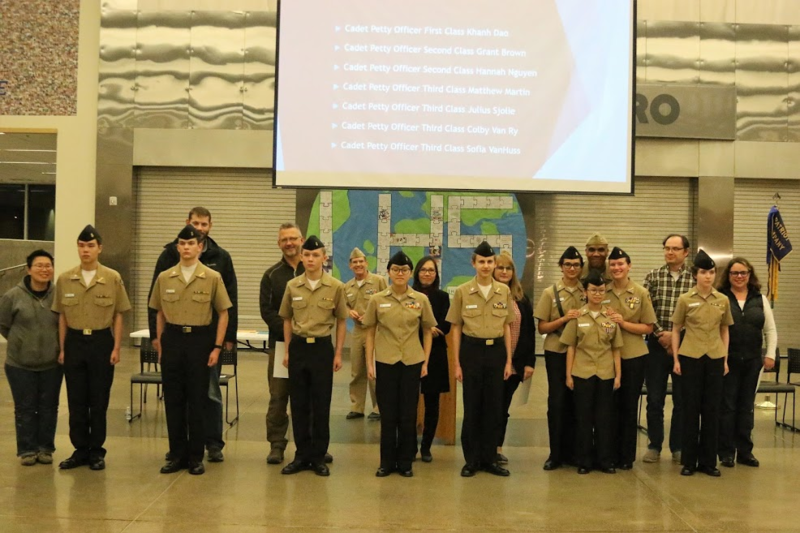 Cadets must advance through the ranks, pass the Cadet Chief Petty Officer Exam, and pass an oral board that is conducted by Chief Spears and Captain Deehr. Cadet Chief Petty Officers Bruce Vagt (far left, 11) and Kerrek Matson (second from left, 12) were advanced to Cadet Chief Petty Officer earlier in the year. 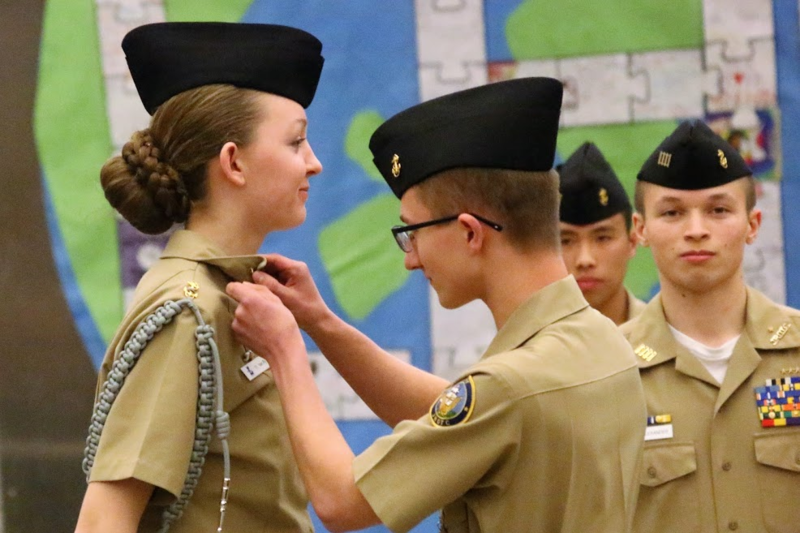 Cadet Chief Petty Officer Olivia Van Ry is advanced to Cadet Senior Chief as she relieves Cadet Senior Chief Kerrek Matson as the Cadet Command Senior Chief. Cadet Lieutenant Alex Pham (12) is promoted to Cadet Lieutenant Commander as he relieves Cadet Lieutenant Commander Alex Chandler as the Cadet Commanding Officer.